Bill Frisell gigs at Ronnie Scott's turn the club into the Quiet Coach. The music is played at a volume level where you can hear the sound of wine as it is poured into a glass, when you know that a fork has been put back on a plate. But yesterday evening, every single person in a full Monday night house was drawn in completely, magnetically, truly, magically and deeply. Somehow, the etiquette of the Quiet Coach prevailed throughout the band's two sets. 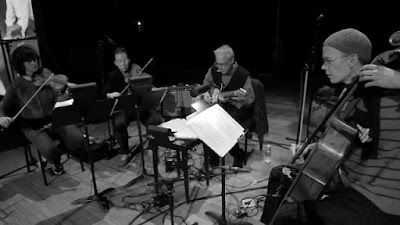 Frisell himself at the end looked surprised, but was clearly very grateful. The guitarist and his three long-standing bowed-string colleagues, in a formation previously known as the 858 Quartet, draw listeners in to their hypnotically slow-moving world. Frisell himself is an absolute master of setting up and holding a slow pulse, these are not so much speeds as concentrated states of being. One fine example was Going to California from the remarkable album Big Sur which opened the second set. Then there was a deliciously slow Jitterbug Waltz, with every contour of the tune relished, and played with a mischievous smile. This group is a vastly experienced unit, each player's individual leanings are welcomed and accommodated. The player who held my attention throughout, was violist Eyvind Kang, who consistently was able to surprise in the directions he took the music, and the sheer range of sonorities he can elicit from his instrument. From martial rhythms produced by ricochet bowing, to imitating the sound of the Chinese erhu, he was on mesmerizing form, and the intimacy of the club both suited his mercurial nature and allowed him to be properly heard. These are musicians who need to be heard on the own terms, and last night they were. The fact that they were able to work their magic on an entire audience resulted in a very special gig. And there is more tonight.